I waited. Then I painted! The white paint was dry and ready for me to start applying the final layer. As you can see, it’s pretty much done. I ended up bumping the contrast as to make it more defined and interesting. The reference photo was very bright and overly exposed thus not having much in regards to depth. I will see once I’ve worked on the rest if I need to tone it down or not…but right now I think it works. What do you think? I will add the final “bright” white spots at a later date…more than likely that will be when I’m adding all the final touches. I’m really fond of the lemon yellow in the stamen. There’s something so hopeful and cheerful about it! Almost like a shining yellow sun! 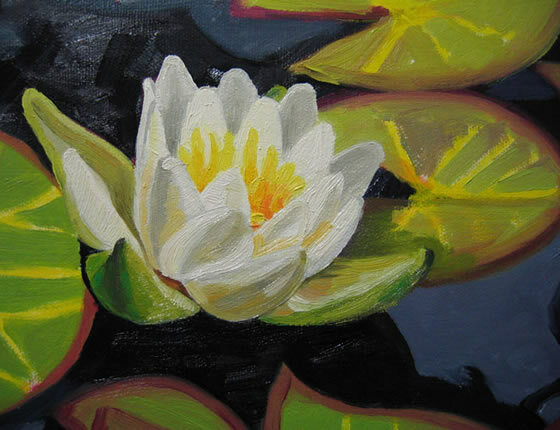 One Response to "Second painting session…White Water lily"
I just discovered your website! Yay! Thank you for sharing!!!! !